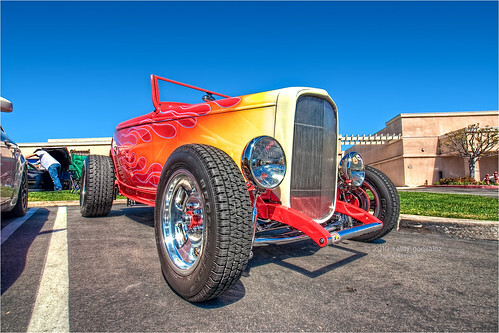 this 1932 roadster was at the dove canyon show, at the 'friends' sports bar back in march. i've also seen it at fuddruckers. took this shot right before the owners called it a day. looks like it would be fun to drive, but what a mess it would make of your hair. lol. thinking about going to pal joey's dream car revue tomorrow in santa ana. took quite a few pictures while i was there last time, and have bumped in to more than a few of those cars at other shows (not literally). nice people too. i'm so tired today...been a long week at work...just looking through some of my older pics. nice to have so many to choose from, and so many waiting for processing...sometimes i wish it would rain more often.